Trees and vines make beautiful container gardening plants when placed on balconies and patios, or dotted around smaller gardens and yards. You can put a blooming tree in a stylish container near a bench where people can enjoy the scent, the shade from the sun, and the sight of the tree as well. Plants that are grown in containers are very popular, they are stylish and always in fashion. Pot gardening can be seen in the loveliest patios and on the most beautiful balconies, in towns and residential areas across the world. The Boxwood is one of these plants: it is an evergreen bush that is loved because it can be trimmed into various shapes. It can give a very nice decorative effect to any dwelling, and as it has shallow roots it can be easily grown in containers as well. Camellias are beautiful when they bloom; they are evergreen and not too sensitive. They are usually grown in containers where they can reach approximately 7 feet in height. They can be used as ornamental flowers either in gardens or on balconies. The English Laurel is another popular plant that's often seen in containers and pots. These plants are used as garden hedges since they grow quite fast but that doesn't prevent you from keeping them in a pot. Your container gardening plants choices can also stretch to many of the bigger plants and trees. You can even grow Redwood trees in containers! I know that doesn't sound right but it is correct. The tree will grow slowly as it will not have the freedom it would normally have in open ground. If you don't want it to grow to high all you need to do is to trim the branches and pinch out the new growth and make it look more like a bush. You should use a large container when growing Redwood just to give a chance to be healthy; it should have at least 24 inches in diameter. You will be surprised how nice it will look, and you can proudly own a tree even in the smallest garden or yard! Every couple of years, lift your trees out of the container, trim the outside roots and the tap root, and put them back in the same container but with fresh compost to fill the gap you just created by trimming the roots. The root ball will become finer and provided you do this in the early spring before the sap starts to flow the tree will not be damaged through this process. The clematis is a vine that has lovely purple flowers. It thrives well in containers, and it can handle any climate well, but make sure you don't leave it outside for the winter. When you choose a pot for the clematis pay attention more to the depth of the container than its width, since these plants have deep roots they do need a deep container. Of course these are just a few examples of container gardening plants. You can grow almost anything in a container. 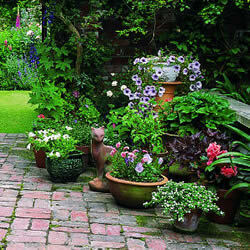 Many people like to grow vegetables and herbs in containers and pots as well. If you love fresh vegetables, why not give it a try? You can grow container tomatoes for instance very easily on your balcony, and growing herbs in this way provides you with some fresh flavours for your cooking.